JTF troops met a gory and grim sight yesterday at 4 militant shrines uncovered inside the creeks in Cross River State. 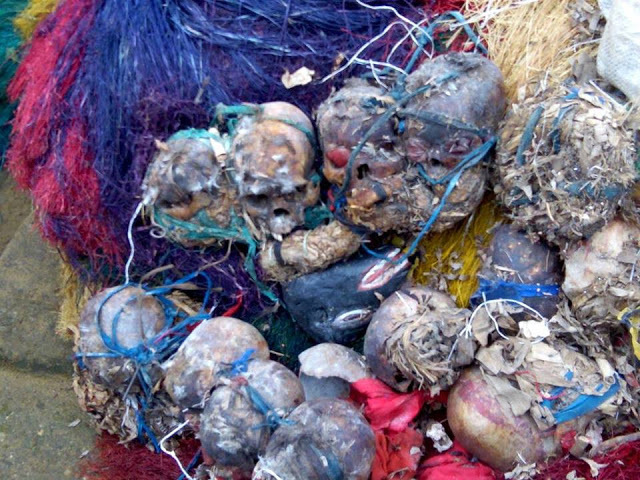 According to the officials of Operation Delta Safe, the skulls of 25 humans believed to have been murdered for ritual were discovered inside the creeks of Akpabuyo and Bakassi LGA of Cross River state yesterday. The shrines reportedly belong to a deadly militant group, the Bakassi Strike Force. The troops who invaded the area following tip off from vigilant residents also found other human body parts that littered the entire area including a complete human skeleton. Confirming the development, the Deputy Coordinator, Joint Media Campaign Centre (JMCC), Lt. Com. Thomas Otuji, said the operation was conducted by ODS’ Sector 4.